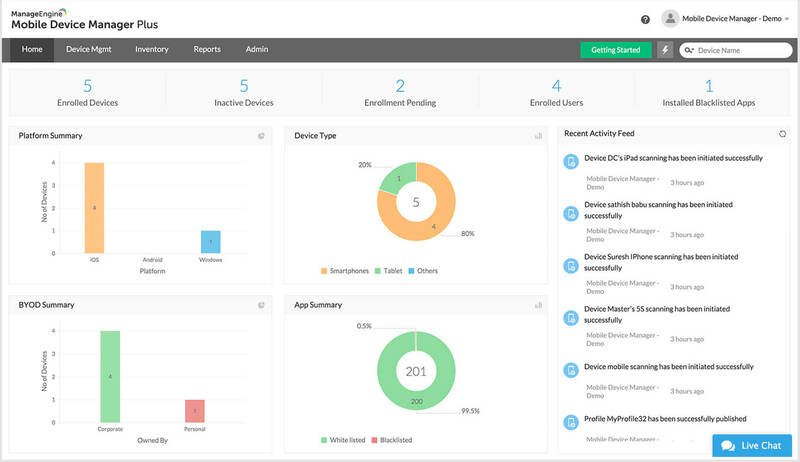 Mobile Device Manager Plus is a part of the Zoho Suite. Mobile Device Management (MDM), made easy. Mobile Device Manager Plus from ManageEngine, the IT division of Zoho, lets you set up, supervise, and secure your enterprise mobile devices and apps. Oversee and control corporate and employee-owned devices on your network. Efficiently manage all iOS, Android, and Windows Phone devices from procurement to retirement. Enroll your organization's fleet of devices with platform-specific enrollment practices including Apple DEP, Samsung KNOX, and Android NFC. Maximize security with device authentication, strong passcodes, and containerization of BYOD data. Protect devices and corporate data with remote device lock, full or selective data wipe, and geotracking of lost assets. Control the life cycle of corporate apps from deployment to retirement. Push business apps to devices silently, manage volume licensing, and black list apps that aren't enterprise-approved. Access corporate emails safely by collaborating with email platforms such as Office 365 and Exchange ActiveSync. Enhance security with content encryption and control mail data access by other apps. Regularly audit devices and apps. Generate detailed reports on all mobile assets and their app inventories. Routinely check for compliance status and report lost, jail-broken, or rooted devices. "ManageEngine MDM is the best choice we could make given its price and functionalities present." Start managing your devices now.